Project34 ransomware uses sophisticated techniques to infiltrate computers and hide from its victims. Use Reimage to determine whether your system is infected and prevent the loss of your files. When did I get infected with this ransomware? Project34 virus is the name of brand-new ransomware classified to @india.com crypto-malware family. After taking a first look at the malware, it seems to be the misdeed of the same ransomware gang of hackers which have released dozens of crypto-malware last year. While some of them were single-time threats, others such as Dharma ransomware have evolved into a terrifying threat with several branches of it. Fortunately, that some versions of their malware are now decryptable. However, this fact does not suggest that you should let your guard down. Even if the ransom message is presented in the Russian language, this virtual menace might attack residents of different countries. What is more, the style of the ransom suggests that the hackers are not native Russian speakers so that they might target any country. In fact, residents of economically developed countries are more likely to be attacked. If you happen to avoid this threat, take a look at the prevention tips below. Otherwise, proceed to Project34 removal. One of the options to do that is to entrust the elimination process to Reimage or Plumbytes Anti-MalwareMalwarebytes Malwarebytes. Throughout the first three past months of 2017, the cyber world has been already rich with a variety of new cyber threats. Former notorious hackers are making a move as well. Even if IT experts have come up with free decryption tools, the cyber villains make sure to preoccupy them with more elaborate ones. Project34 ransomware does not stand out much in its operation peculiarities from the rest of the group. 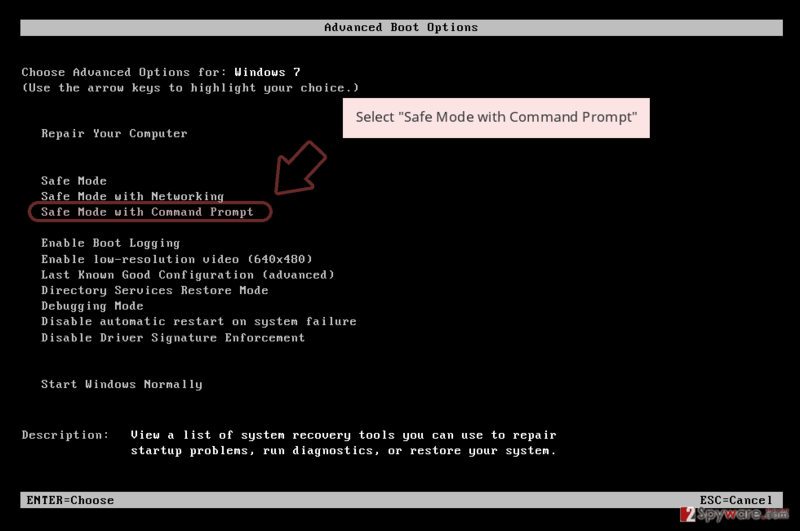 Once it enters the system, it modifies the settings for it to fully perform the command. Within several minutes, Project34 ransomware encrypts personal data. Note that it is able to encode the files in all local disks. It is still unknown whether it can avoid data in archive discs. Within the process, the crypto-malware appends .project34@india.com file extension. Concerning the ransom message, Project34 malware seems to be still under development since it does not specify data recovery instructions clearly in the ransom note. Only a brief note informs the victims to contact the racketeers via project34@india.com and indicate their IP address. When it comes to ransom paying, there are too many uncertainties whether the felons will return the data after receiving the financial transaction. Instead, remove Project34 as soon as possible. IT experts speculate whether Project34@india.com virus will evolve into a global threat. Do you recall opening the invoice or another similar document attached to an email? If yes, then you have the answer how Project34 hijack happened. Less popular threats are also distributed via trojans or exploit kits. Often they lurk in the gambling or gaming websites, torrent sharing domains. If you tend to visit such websites frequently, there are high chances of encountering more or less destructive malware. On the other hand, now crooks have developed techniques how to invade legitimate domains and place their malicious content there. Smartphones users might download ransomware along with an infected app, while smart TVs and watches are also vulnerable for cyber attacks. Cautiousness is a necessity while browsing the Web. When it comes to Project34 removal, it would be better to remove the virus with an anti-spyware program. 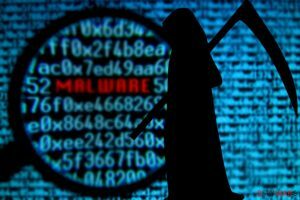 Updated software is likely to detect all components of the ransomware and eradicate them completely. On the other hand, it is not surprising if this virus shuts down your anti-virus utility. 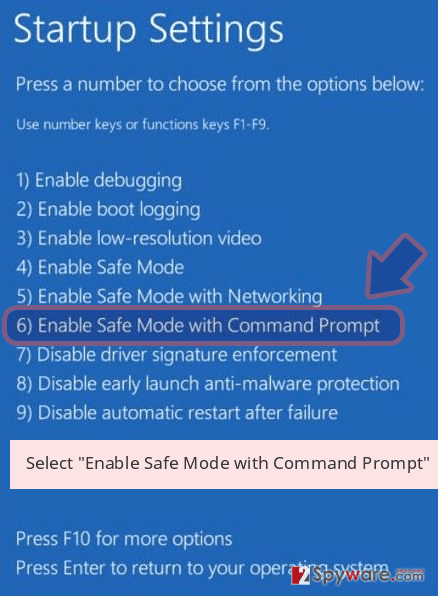 If that happens, use the instructions below to regain full control of the device. Note that you will need to use alternative methods to recover the files. 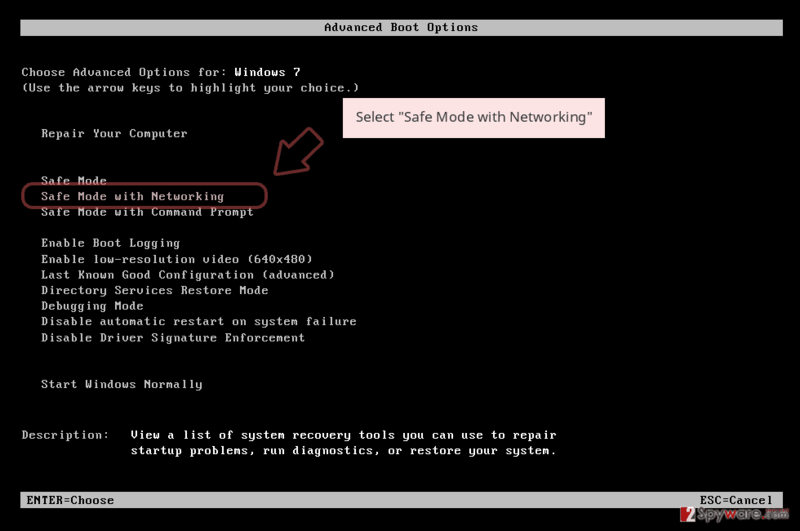 Check your backup settings and try to retrieve the backup copy of the system image. If you have run out of solutions, some of the below suggested recommendations might be useful in your case. 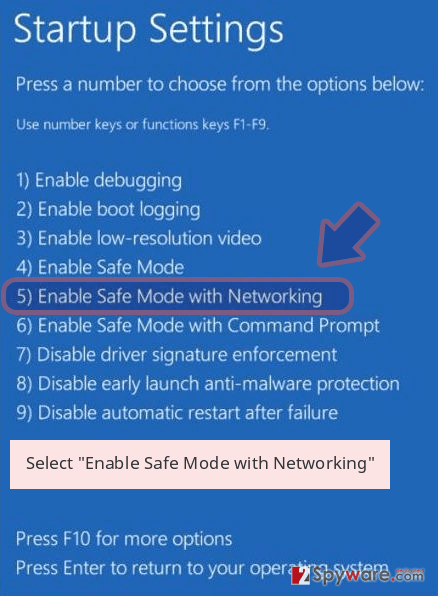 Launch Safe Mode to continue the elimination of Project34 ransomware. Log in to your infected account and start the browser. Download Reimage or other legitimate anti-spyware program. Update it before a full system scan and remove malicious files that belong to your ransomware and complete Project34 removal. 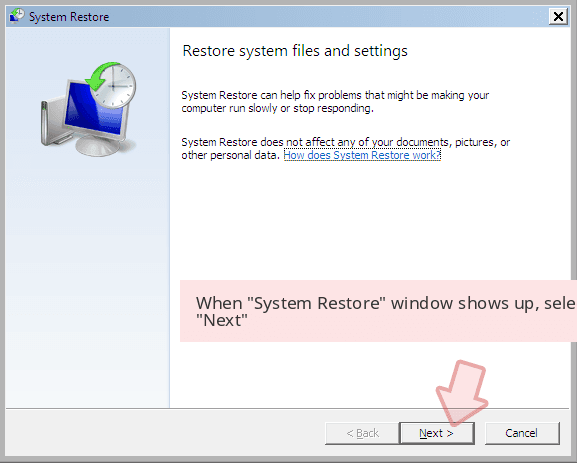 System Restore is another option you might try. 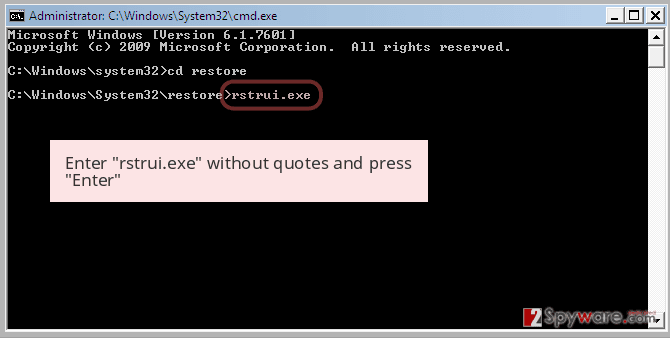 When a new window shows up, click Next and select your restore point that is prior the infiltration of Project34. After doing that, click Next. 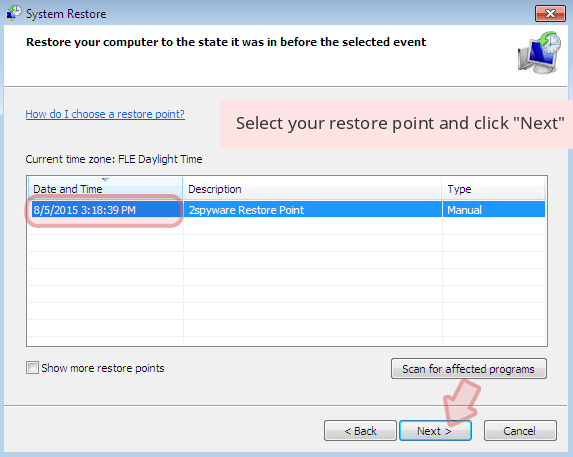 Once you restore your system to a previous date, download and scan your computer with Reimage and make sure that Project34 removal is performed successfully. Guide which is presented above is supposed to help you remove Project34 from your computer. To recover your encrypted files, we recommend using a detailed guide prepared by 2-spyware.com security experts. After you remove Project34 virus, install this program and follow the instructions to restore the files. The key advantage of this program is that it recreates the files based on shadow volume copies. This method might be efficient in recovering the files affected by Project34@india.com ransomware. ^ Lucian Constantin. Free decryption tools now available for Dharma ransomware. PC World. News, tips andreviews from the experts on PCs, Windows, and more. ^ Ichiro Kitamoto. Japan becoming prime target of 'ransomware' crime. JapanToday. Japan News and Discussions . ^ Chris Potter. Hackers Lock Pennsylvania Dems Out of Their Email, But They Refuse to Pay Ransom. Government Technology. Government Technology State and Local Government News and Articles . ^ Ben Farmer. Smartphones, TVs and watches could be held to ransom by hackers, cyber security chiefs warn. The Telegraph. Local and World News. ^ Sam Edwards. Are smart buildings safe from hackers and privacy breaches?. Phys Org. News and Articles on Science and Technology. This entry was posted on 2017-03-14 at 03:57 and is filed under Ransomware, Viruses. You can quickly scan the QR code with your mobile device and have Project34 ransomware virus manual removal instructions right in your pocket. How did you remove Project34 virus?